An' there was somethin' there this morning about Kipper the dog and lollipops. Start those bread bowls for dinner. So there it is, though I didn't finish it. Early on in the day, I was looking at my shiny new Amazing Math book. Amazingly enough, one of the first two projects is making a Sorobon--a Japanese abacus. That's amazing because I had mentioned to my friend Jessica about a week ago that if she found books or sparkly things to play on an abacus, to please let me know, that I had been thinking about that for years. Then lo and behold, this morning happens. Put cinnamon rolls in the oven. 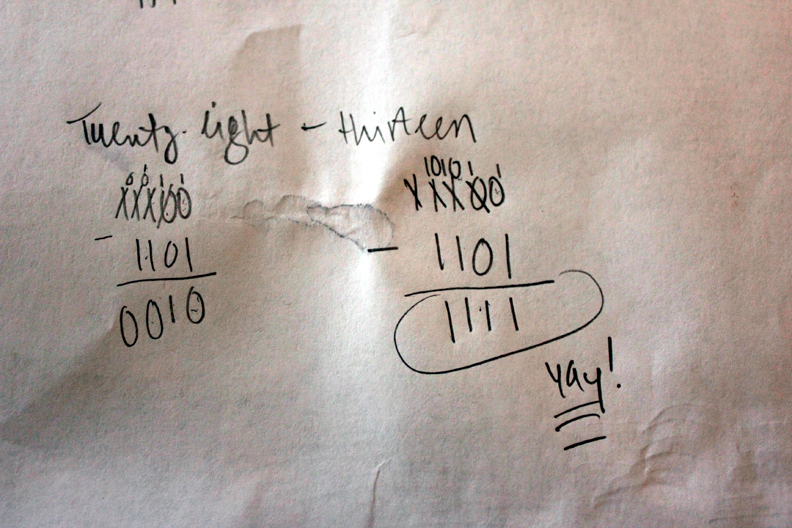 So I was thinking I had this thing in the bag (heh) so I wrote out numbers up to thirty (to make myself a chart), and their binary equivalent. Multiplication? Easy. Addition? Easy. Subtraction? Easy. Wait. 'Til I got to twenty-eight minus thirteen. aka, 11100 - 1101. Uh... wait. :) Yeah. Not so smart after all, is she??? But this is the land of opportunity, this internet we have, and I can just do a search for Binary Subtraction. And be led here. And I can feel a little bit better about my taxed brain because presumably (as they're talking math and computer sciences) they're not talking to third graders. ' Course, it could be that I am embarrassingly wrong, and these things are taught to third or fourth graders. We did not have computer science classes in 1977 when I was nine, friends! Let's try 11100 - 1101 again. Can move on with my life. Isn't it so awesome the way these little inquiring/learning trails work??? On to the living, then! My husband was a computer engineering major/math minor and is a freakin' genius with number. So when my artsy fartsy brain encounters all of these things that I think, ooooh, wow, cool, new to me my husband says something like he learned it in 3rd grade. I then remind him my IQ is as high as his is, and ask him who the singer for the B-52's is or how Van Gogh died, and he shuts up. Bwahahhahahhahah! 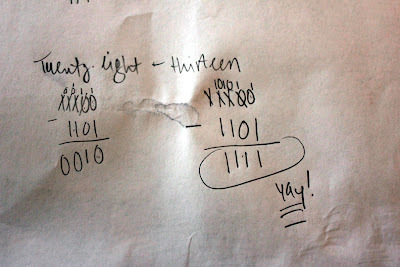 (just being silly - love finding new math stuff for boys too - so cool, and we all enjoy it)! Cool, too, that other than being excited about discovering neato things/knowledge, our enthusiasm is a great demonstration of natural inquisitiveness and autodidactic learning. Should I check into a school, so I can learn, do you think??? i'm with Denise o nthis one. i always pass math stuff on to my husband. he's a whiz with numbers and such. I was awful at math in school because of how it was taught - goodness, I thought I was so stupid for years. Now that I am out of that environment numbers come a bit easier for me because I can arrive at my answer in my own unique way...not in a way that is taught. Oh, Debbie, I didn't put in a proper link! It's fixed, now.